Final Fight 2 is the sequel to the original Final Fight, released in 1993. 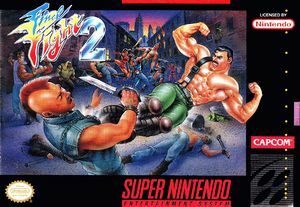 Unlike the SNES version of the first game, Final Fight 2 supports two-player simultaneous play and has a total of three playable characters. With a new mysterious leader the Mad Gear Gang plans to dominate the entire world. This time they've kidnapped Genryusai and his daughter Rena. Now Haggar must travel around the globe to search for them... but he's not going alone. Carlos and Rena's sister, Maki, are joining the slam-fest to put the gang away for good. Search for numerous weapons such as knives, nightsticks and 2x4's or find food to recover your strength. The graph below charts the compatibility with Final Fight 2 since Dolphin's 2.0 release, listing revisions only where a compatibility change occurred. This page was last edited on 21 February 2018, at 05:38.